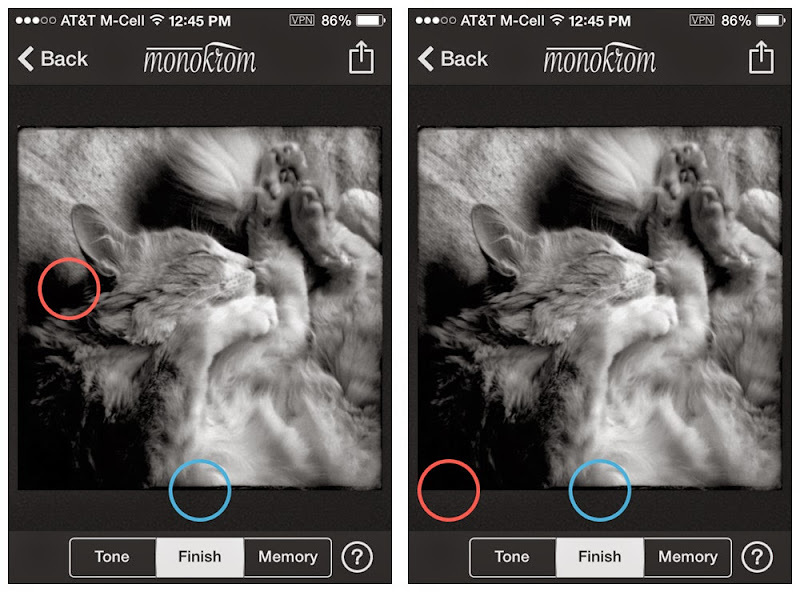 Earlier this week, I discovered Monokrom, an application for the iPhone and iPad, that converts color photographs into Black & White images smoothly and quickly with one of the most elegant interfaces I have come across in a while. 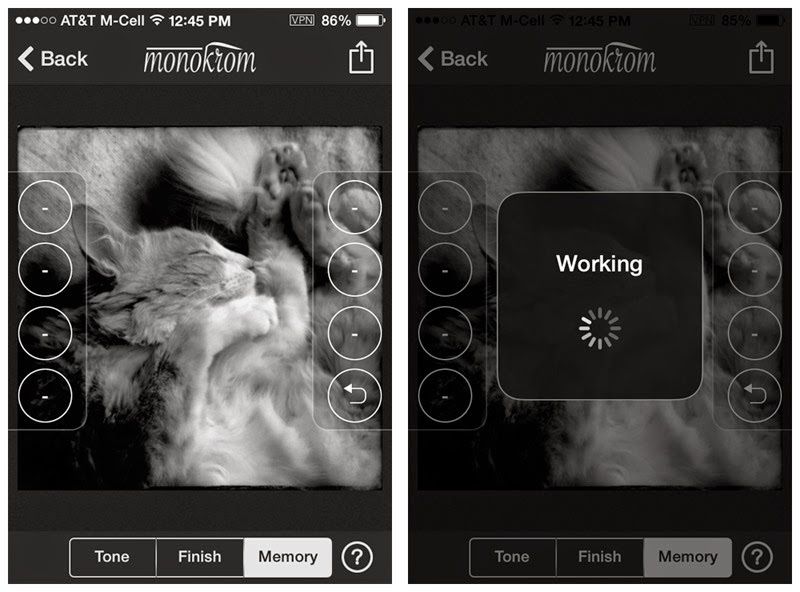 Monokrom is mostly intuitive, bypassing the various layers of conventional conversion we are use to seeing. By having the layers be transparent and accessible via the menu bar located at the bottom of the screen. 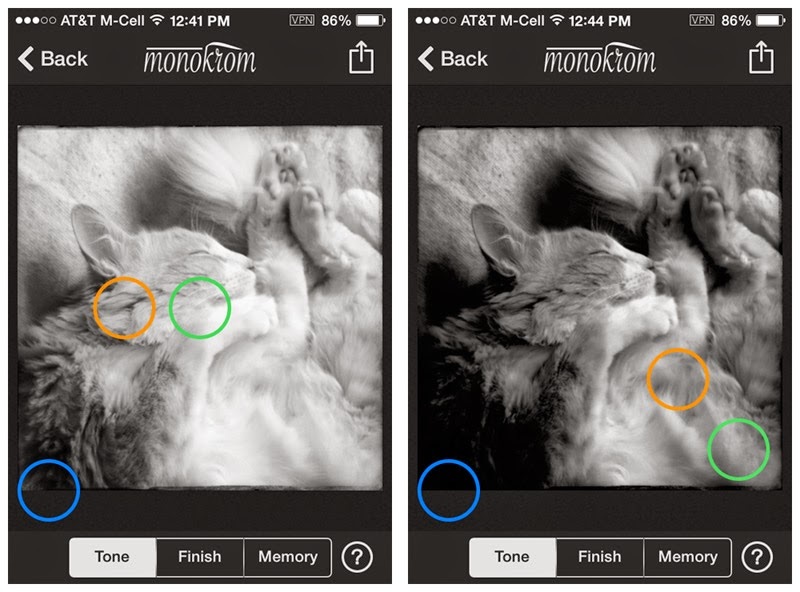 When you have imported an image to be edited you are in the Tone stage of Monokrome. 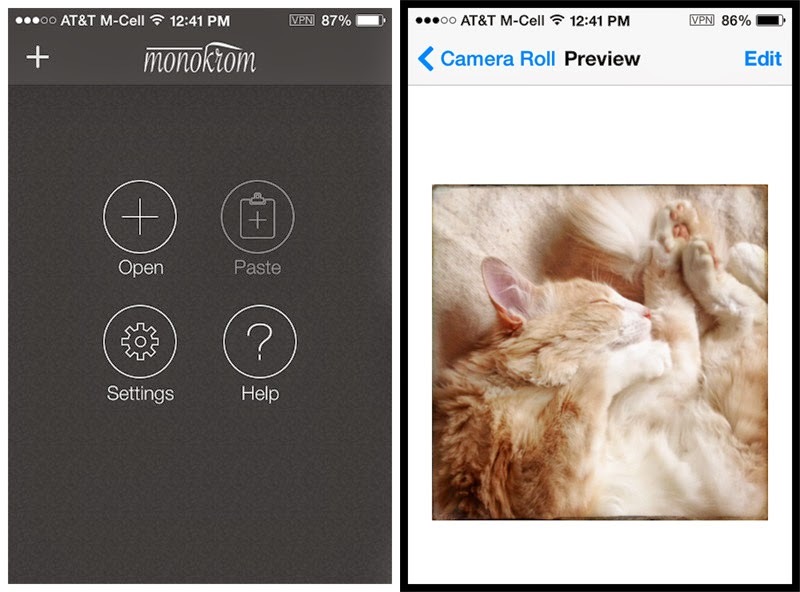 When one imports an image from the camera roll, Monokrom applies a general default adjustments from which one works. This is seen in the left screen shot. The simplicity of this program, are the circles Monokrom calls pucks. These pucks are moved around one at a time to achieve the desired effect and alteration of the image. The orange puck controls overall brightness when moved up and down, it also controls the RGB variable when one move it from left to right. The green puck adjusts contrast, depth and drama. When moving the puck up and down it adjusts contrast but when resting in the middle of the image, contrast is neutral. When the puck is moved from left to right, the tones of the photograph are effected. The blue puck is for adding a duo-tone tint. When it is moved from the bottom of the screen up, this increases the amount the tint, while moving left to right, this changes the color of the tint. In stage two, Edit-Finish Mode the reddish-pink puck adds noise/grain to the image. 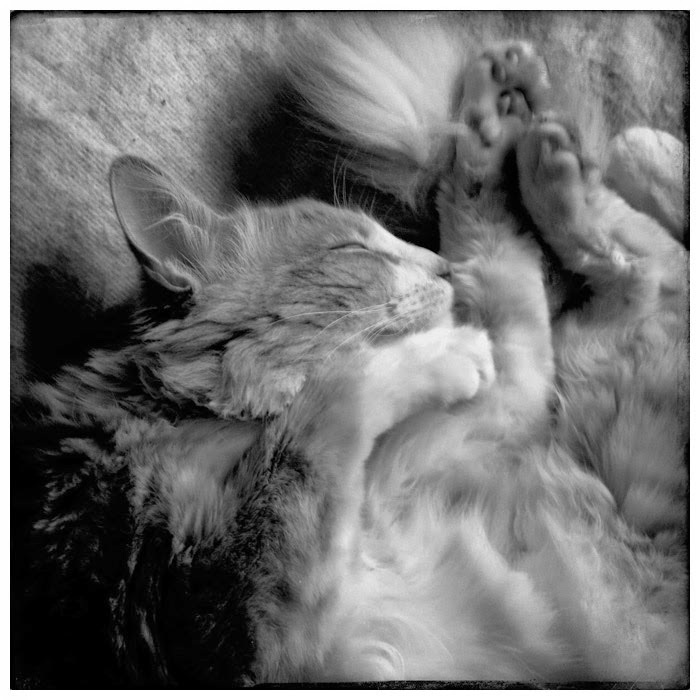 When moved from left to right, increases the grain, while up and down, this creates a rougher and more textured look. The blue puck controls vignetting, movement up and down, increases the effect and moving left to right changes the size of the area being darkened. In the final stage, Memory, you are able to save your adjustment settings so that if you are doing a numerous images, you are able to quickly apply the settings from a master image to other photographs. There are seven settings you can save, while the eighth slot is an undo feature. The memory aspect is very helpful and saving a setting is very easy. Simply hold down an open memory slot and a dialogue box comes up. However you can only add two characters to identify the preset. Currently you are only able to export your image to the camera roll, send it as a text message, or post it via Twitter. Being able to export to other popular social network sites is not available. 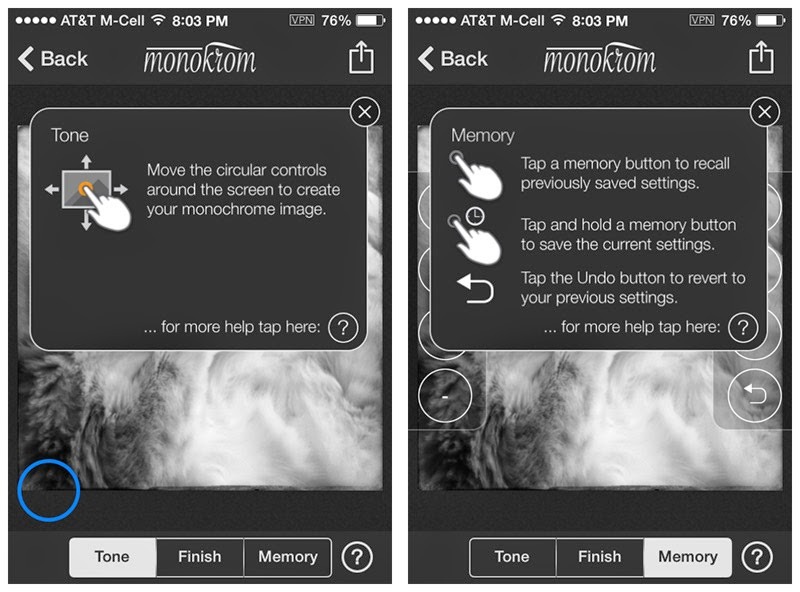 One other nice feature within Monokrom are their instructions. While working within one of the three sections, there is a guide available, but for a more detailed understanding of the application, one must head to the main help page. 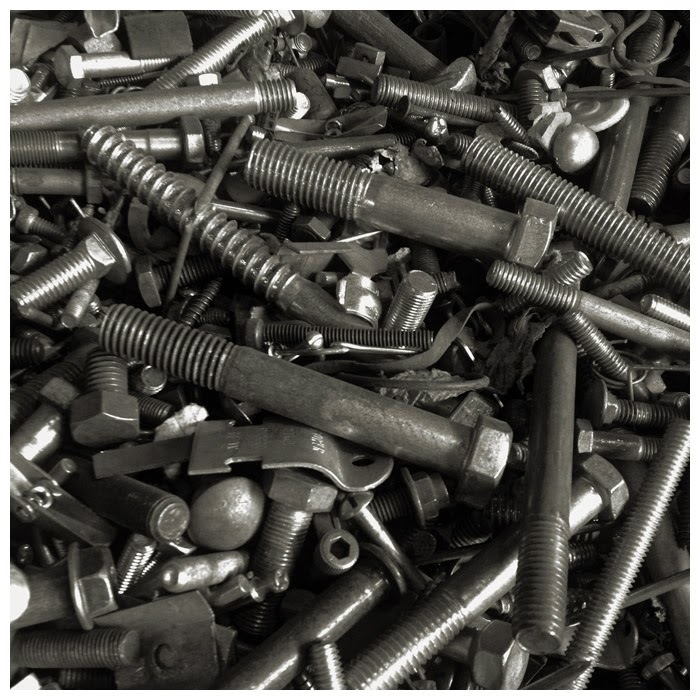 There you will find an extensive and easy to understand the various functions of Monokrom. 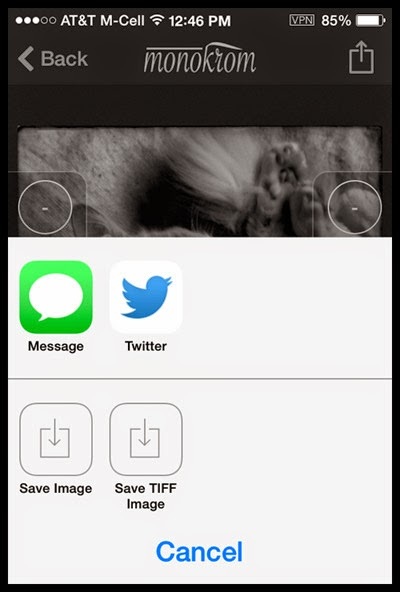 While the program saves ones photographs as a JPG, by going to settings within the application, you can change this to save your work as an uncompressed TIFF document, something a number of application developers are finally adding due to the fact that many camera applications permit shooting in TIFF. 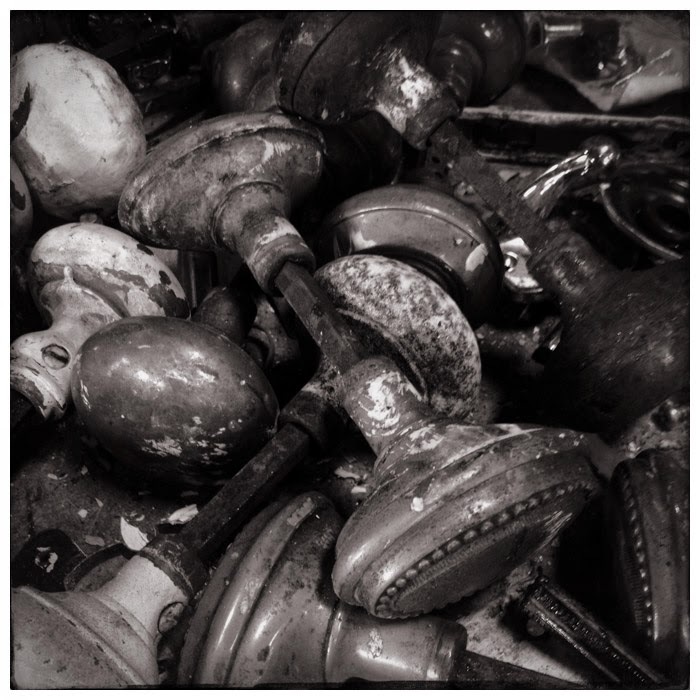 While I was exploring the various aspects of Monokrom, I discovered that when one is in Monokrom and selecting an, that when holding down on the image or even swiping ones finger over it, the image is previewed as a generic B/W. This intuitive and easy to use program does what it sets out to do and does it well. One aspect of Monokrom is that it only takes up 2.9 Mb of disk space of ones iPhone/iPad, unlike other B/W conversion applications. I did feel that Monokrom lacked an essential feature. Not being able to either double tap or pinch to zoom in order to enlarge the image and being able to see ones results, especially if one plans to apply any grain or noise texture to the image. There is also the inability to export a number of social networks. While I recommend Monokrom, I do have a list of suggestions for future updates. These add-ons I feel will make Monokrom a killer application. Suggestion for making Monokrom even better. longer is on the iPhone/iPad, like we have with ImageBlender. We received 5 codes to giveaway of Monokrom and if you would like your chance at being one of the winners, here is what you will need to do. 1: You need to leave a comment and most important of all, include your contact information, so I can send you your code if you are one of the random winners. If no contact information is provided and your name was drawn, another winner will be chosen in your place. 2: Five winners will be chosen by random drawing on Monday, April 7 after 6 pm PST. Drawing closes on April 7 at noon PST. When you go to comment, do not be fooled by ‘0’ Comment, it is a glitch that just loves to confuse people. 3: Please consider following TiPA. You can do this by using NetworkedBlogs or Google. This way you will always be kept up to date. Congratulations to the winners . . . I look forward to seeing what you have created. Your codes will be sent shortly with instructions on how to redeem them. Thank you all for your participation in TiPA’s GiveAway and a special thank you to Darren Richards from Richards Imaging for making the program available.